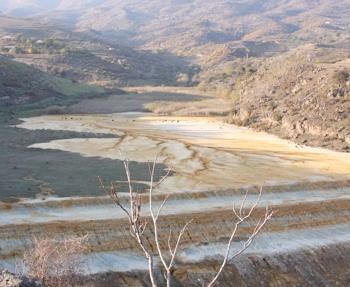 AKHTALA, Armenia, September 14, 2010 (ENS) – Environmentalists in Armenia say the planned re-opening of a mining waste dump could present a health risk for people living nearby. The Nahatak storage facility was built 35 years ago to house chemical waste and tailings from a copper ore enrichment plant at Akhtala in northeast Armenia. It was closed at the end of the Soviet period. Metal Prince Ltd., the firm that owns the Akhtala plant, is planning to start using the storage site again. Local residents say they have not been consulted about the plan or warned of any possible risks. “The company has, above all, an obligation to hold public discussion groups and to ask local farmers whether they agree to having a dangerous new facility right under their noses,” said Inga Zarafyan, head of the environmental group Ekolur. She says the firm should publicize plans for how the dump would be refurbished and run. Local residents complain that material from the dump has been contaminating their land for years. Villagers in the area complain that they have received no information about Metal Prince’s plans for restoring the site. “We live directly near the dump so we’ll be the first to be harmed. But no one has time for us; they don’t even ask us,” said Chochkan resident Anahit Vahramyan. Residents of Tchochkan and Ayrum villages are also worried. The villagers’ main concern is that cattle pasture and children play in dangerous proximity to the tailings depot. Tchotchkan resident Mher Lorsabyan recalls how his livestock died after grazing near the tailings a few years ago. “Once I used the water of the tailings depot to irrigate my land, and the whole harvest was spoiled,” he said. Metal Prince has expressed surprise at the concerns now being raised. It says no one raised concerns about the dump although lay abandoned for two decades, and environmentalists have only started talking about it now that the company is starting to refurbish it. 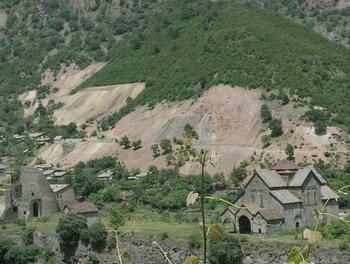 Armenia’s environment ministry is concerned about the current situation at the dump in its unrepaired state. Seyran Minasyan, deputy head of the ministry’s Environmental Impact Monitoring Centre, says drainage channels underneath the site have become blocked. Vladimir Abelyan, a consultant working for the Akhtala ore-enrichment plant, said concerns about the re-opening of the dump are unfounded. He said there is nothing like as much as 22 million cubic metres of waste at the site, and there is no chance of material sliding into the River Debed. Abelyan said the site has nearly two million cubic metres of spare space, and given current levels of ore production, it could be in use for another six or seven years. He also said the pipes taking water to and from the waste storage site are being restored to prevent any chance of polluting neighboring fields. Local residents said they have not been informed of this work and expressed concern that the company had not thought to tell them. American-Armenian businessman Serob Ter-Poghosyan, director of the company, says that the pipeline connecting the interim tailings depot to the Nahatak tailings depot and associated water pipelines are currently under reconstruction. Metal Prince has said it plans to hold public hearings after the tailings depot reconstruction is complete.